Make your club Official with our vivid Custom Flags. We print whatever you want on our POLY SILK fabric. Hi Rez fine detail photos and text are no problem. Send us your own file or our professional art department can create it for you. It's Easy! Standard size is 3'x5' and flies in the slightest breeze. As is customary, one side is printed and the mirror image is visible from the other side. Custom sizes are available. Quantity discounts are available. Please call for quote. We also can create fabric signage for separate stage #'s and description. Call 1-877-289-8374 for more details. Allow about 4 weeks for delivery. Expedited delivery is available for an extra fee. 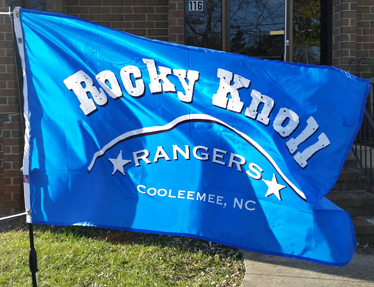 3'x5' Custom Flag- $99.95 each complete with set up.